Sony's PlayStation Now beta invitations recommend a wired Ethernet connection with a "5Mbps or higher" broadband connection speed. When Sony first unveiled PlayStation Now at its CES presentation earlier this month, it also promised to initiate a PS3-based beta test of the new service before the end of January. 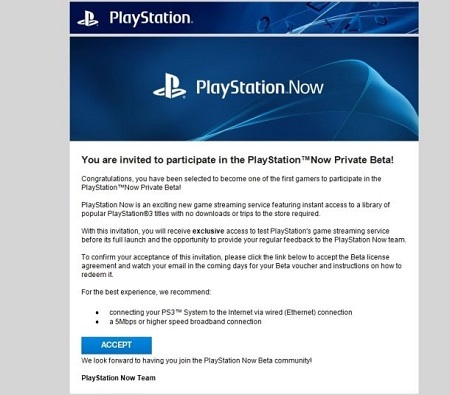 With the month's final days ticking by, it would appear that Sony is keeping true to its word as invitations to the beta are beginning to arrive in lucky users' email. The invitations ask recipients to accept a beta license agreement that will then grant them access to a beta voucher that should arrive in their email "in the coming days." It also recommends that beta participants connect their console to the internet "via wired (Ethernet) connection" and that they maintain a broadband connection speed of "5Mbps or higher" to achieve "the best experience." The invitations unfortunately don't contain much else of note. That said, it's still pretty exciting to see the first stages of Now getting under way. Granted, recent news that Now may not include PS1 and PS2 games is a bit of a potential downer. That said, the way I see it, this beta just gets us one step closer to a PS3 library I can play on my Vita, which is obviously what everyone is concerned about.